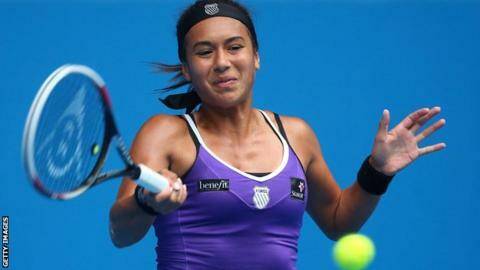 British number one Heather Watson suffered a surprise defeat to Anastasija Sevastova in the second round of the Pattaya Open. The Latvian is ranked 143 places below 20-year-old Watson, who this week achieved a career high ranking of 40. Sevastova won a first set tie-break and broke Watson's serve three times in the third set to win 7-6 (7-4), 4-6, 6-2. Watson was seeded eighth in Thailand after a run to the third round at the Australian Open. Sevastova signalled her intent right from the start, breaking Watson's serve in the first game of the match. Despite breaking back immediately, the young Brit was beaten comfortably in the tie break as Sevastova took a one-set lead. Watson was able to level the match after a decisive break in the the ninth game of the second set. But she was only able to hold her serve once in the final set, and although Sevastova faltered when serving for the match, the Latvian wrapped up the victory on Watson's serve after two hours and 26 minutes. Top seed Ana Ivanovic of Serbia was also knocked out, losing 3-6, 7-5, 3-6 to Japan's Ayumi Morita in a first-round match delayed by rain.